The EPIC Diode Laser by Biolase is one of the most versatile pieces of technology used by Dr. Kristi Alexander. 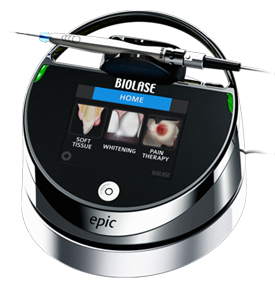 Utilizing the latest in laser technology, EPIC is the only diode laser in the US approved for soft tissue procedures, teeth whitening, and pain therapy (typically TMJ). How is it that one device can address such a wide variety of problems? Well, it is all made possible because of two important features; the adjustable frequency of the laser, and the interchangeable headpieces that completely transform its function. For soft tissue procedures such as periodontal pocket therapy, treatment of ulcers/cold sores, or even reducing bacterial count in periodontal pockets, there is no better tool than the EPIC. The epic is used in all deep cleanings to help with reducing bacterial count and helping the stimulation of possible bone growth. It also helps with softening tarter on teeth,so that it is easier to remove with our ultrasonics and hand scalers. This all adds up to improved comfort and healing time for out patients. When performing teeth whitening, the EPIC need only be equipped with its special whitening headpiece that helps distribute its beam across the patient’s teeth. With an average whitening of 4-6 shades in only 20 minutes, the EPIC is among the fastest and most efficient of any in-office whitening systems. Those of our patients who experience temporomadibular joint disorder (TMJ) or other chronic oral pains may find relief from the EPIC’s most unique feature, pain therapy. Using what is called the Deep Tissue Handpiece, the focus and depth of laser penetration is controlled to only the precise area that is the source of the pain. Approved by the FDA as treatment for oral maxillofacial pain, think of this procedure as simply a deep tissue massage for your mouth and/or jaw. 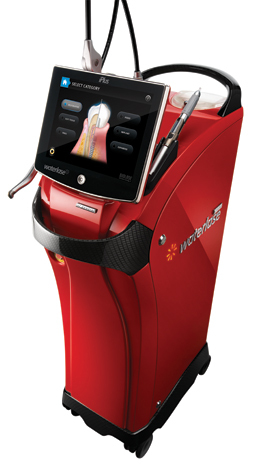 The iPlus Waterlase dental laser by Biolase is another one of the tools utilized at Dr. Kristi Alexander’s office, and as one of the premier systems available, it can be used on both hard and soft tissues. Furthermore, since no traditional drilling or anesthetic is required, its pain-free approach makes it one of the best options available to our patients. Since drilling is always one of the aspects of the dentist that patients dread the most, the iPlus is by nature a great improvement. It is extremely versatile and can be used for a wide range of hard and soft tissue procedures. From decay removal, cavity preparation, root canals, smile design, gum and bone surgical procedures and many others. Lasers are able to remove tooth enamel decay, bone, and gum tissue precisely while leaving surrounding areas unaffected. This conserves more of the precious tooth structure you were born with, helping you to maintain your natural teeth longer. IPlus has shown to increase bond strength of tooth-colored restorations resulting in longer lasting fillings. The iPlus has the capability to help treat root canals and periodontal pockets. In both these procedures a thin tip is placed in the area and the laser energy sterilizes the area and kills the bacteria. In Root canals this is a step of the cleaning process before filling. In the periodontal pocket therapy this helps kill the bacteria while leaving the healthy gums and tooth free of infection. Additionally, since this procedure is minimally invasive, gum tissue “reattaches” to teeth faster and out patients experience quicker healing times over traditional periodontal methods. It is truly one of the great recent advancements in dentistry!